I really have nothing to report this week. I am though pissed that people are wasting precious water, but I digress. 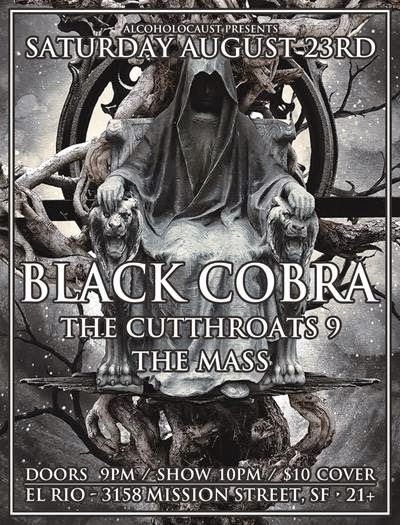 I'm glad and waiting for the huge show this Saturday at El Rio here in San Francisco with Black Cobra, The Cutthroats 9 and The Mass. These three San Francisco bands have their own following and we are all coming together for one night. Black Cobra will be banging & heavy riffin' throughout the rest of the night. The Cutthroats 9 will be bringing the Unsane-Noise Rock hammer down as they play. Then we have The Mass. They haven't played live in years, but they will bring their "A's" Metal game to the show. If you haven't been to a good heavy show in a while, this one will knock you to the ground and hopefully they'll pick you up from the pit if it's stable enough. HA! See you there. Replica | Nightlife | Beast EP 7"
Die Choking | Die-Yielding | II EP 7"
Davidians | BauhausBeachHaus | Davidians 7"
Pregnancy Scares | Lobotomy Mind | Control EP 7"